This week, a significant work by artist Alexander Calder disappeared from public view – his mobile “The Universe” was dismantled from the lobby of the Willis Tower on Tuesday and is being moved into storage. 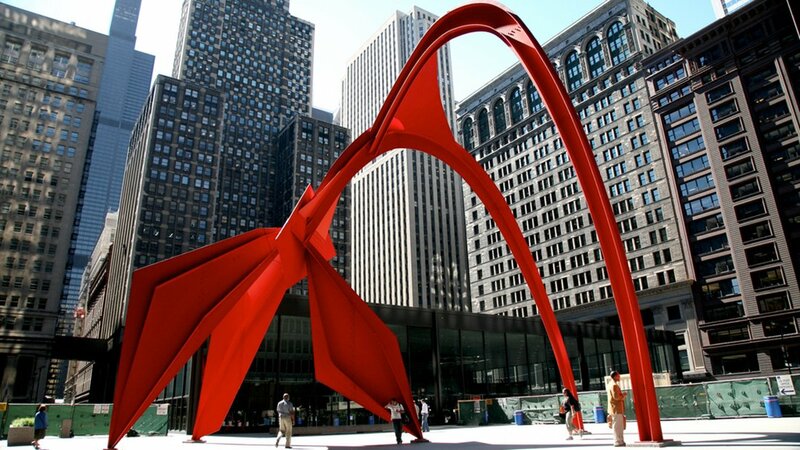 Now, Preservation Chicago Executive Director Ward Miller says that a second major Calder work may also be in danger of disappearing: the bright red 53-foot-tall steel stabile “Flamingo,” which has arced over Federal Plaza between the Kluczynski Federal Building, Dirksen Federal Building and the Loop Post Office for more than four decades. The two Calder works were unveiled on the same day in 1974. Through sources at architectural firms and consultants, Miller has confirmed that developers are inquiring into redevelopment of the Mies van der Rohe-designed Federal Center site, which also includes “Flamingo.” Miller says one plan being explored involves moving all government operations into the Kluczynski and Dirksen buildings, and selling off the post office building to private developers. “Flamingo” could then become subject to sale at private auction. Miller sees any changes to the grouping of buildings as diminishing van der Rohe’s vision. “The relationship of the buildings to one another, and to the Marquette Building and the alignment with the Monadnock Building, the placement of sculpture and open space – it was an artful composition, one of the most important public plazas, designed by a master architect,” he said. Alexander Calder, “Flamingo” (David Ohmer / Flickr) “Flamingo” was the first piece of public art commissioned under the federal “Percent for Art” program, which set aside budget dollars from building projects for public art. The sculpture’s arching shape and flaming color (later dubbed “Calder red”) stand in stark contrast to the black, blocky steel-and-glass forms of the van der Rohe buildings surrounding the plaza. Its placement and scale allow visitors to walk through it, making it a favorite of Chicago photographers. Miller says that the potential loss of “Flamingo” from public view opens a discussion about the true owners of public art. Miller appeared on “Chicago Tonight” on March 7 to discuss Preservation Chicago’s 2017 list of endangered structures in Chicago, one of which was 20th century public art. March 7: This year, the group’s annual list of endangered structures sounds the alarm on not just buildings, but also public art.